What BeanBags are at the Gold Coast Film Festival Twilight Cinema? Bean Bags R Us NewsDesigner Bean BagsDid you See our BeanBags at the Gold Coast Film Festival Twilight Cinema? 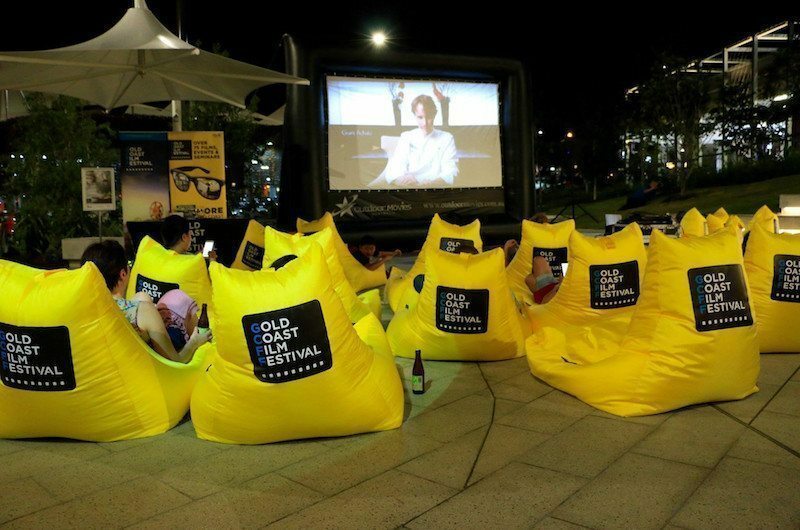 Did you See our BeanBags at the Gold Coast Film Festival Twilight Cinema? If you are a film buff, you may have had a recent close encounter with one of our magical Merlin outdoor beanbags. The Gold Coast Film Festival recently purchased twenty branded Merlin Beanbag Chairs in Minion Yellow. After successfully performing their festival duties, the Merlin chairs are now cast in a recurring role at The Kitchens at Robina Town Centre as comfy seats for the Twilight Cinema. Here’s a little background information about their prestigious new movie connections. A culturally diverse celebration of the cinematic arts, the Gold Coast Film Festival is an annual film festival that focuses on feature films, seminars, workshops, special events and special guests. Through helping to educate, inspire and enable the creative community, the festival aims to encourage the next generation of local filmmakers. This year’s festival screened 38 films from 15 countries around the world. More than 14,000 guests attended the main events. They were treated to genre films, Japanese anime, local independent films, internationally acclaimed dramas and appearances by international film industry experts. Full-length films aren’t the only works showcased during the celebration. The Shorts in Paradise Festival, or SIPFest, was held on Surfer’s Paradise Beach and attracted over 2,000 attendees. Filmmakers from around the country submitted their short films, and submissions are already open for next year’s event. The Gold Coast is well-known as Australia’s top holiday destination. It’s also a location that has its filmmaking heritage. International filmmaking was introduced on the Gold Coast as early as the late 1980s. Since then, the area has played host to crews filming major motion pictures such as Unbroken, Thor: Rangarok and Pirates of the Caribbean. Robina Town Centre is the biggest shopping complex on the Gold Coast. It covers 34 hectares within the suburb of Robina, with seven anchor tenants and more than 350 retail stores. The centre recently opened The Kitchens, a culinary playground that is the first of its kind in Australia. Amateur cooks, five-star chefs and food lovers from around the country can revel in the fantastic, world-class menus and diverse choices that utilise fresh, local produce and honour every aspect of the culinary arts. Top epicurean picks include Fish Lab, Honey Eater Kitchen, Jimmy Grants, Naked Treaties Raw Bar, Betty’s Burgers, Crafted Coffee Co., Eshai Teahouse, Pure Meats and more. The marketplace will also host live music, tasting events, cooking master-classes and outdoor movie screenings at the Twilight Cinema. That’s where we come in. Our comfy Merlin chairs now await viewers in an attractive outdoor setting where food-related movies and other special screenings will be held in the open air. 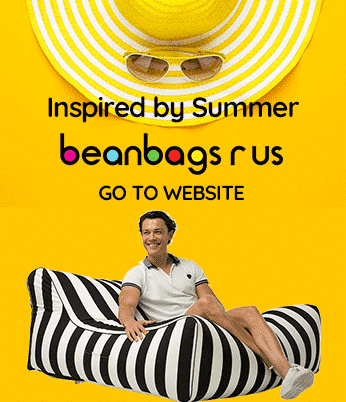 At Bean Bags R Us, we design our outdoor beanbags to provide unmatched comfort and reliable performance for years; that’s why companies choose our products to help them promote their brands. For The Gold Coast Film Festival, our Merlin bean bag was ideal. It’s a large and robust yet stylish and sleek chair created with both adults and kids in mind. The Merlin’s unique tapered design incorporates solid neck, head and back support where it’s most needed while maintaining a chic, cute shape that lends character to any setting. For relaxing under the stars and watching a great movie, you can’t beat the Merlin. It’s the most comfortable seat in the house, and its convenient handle makes it easy for guests or workers to move it as needed. The stain-resistant cover makes it a breeze to clean, so tempting treats from the Kitchens at Robina Town Centre won’t do any permanent damage if they topple. While the film festival chose cheery Minion Yellow for its sunny personality and its perfect contrast to the organisation’s darker logo design, there are ten other trendy colours available to complement your home or business. If you prefer larger, smaller or differently shaped seating options, our range has everything that you need. With your company logo printed on the fabric, your outdoor beanbags can serve as free advertising as well as irresistibly comfortable places to rest. Contact us for more information about our exclusive branded beanbags and customisation options. We’ll be happy to work with you to create the perfect perpetual marketing tool. We’re proud that our bean bags are playing a part in Gold Coast culture. If you haven’t had a chance to check out our luxury movie seats at the Twilight Outdoor Cinema, visit the Robina Town Centre website for details about upcoming movie events. Be sure to bring your appetite and your appreciation for all the work and artistry that goes into making a great film. Where Can I Buy Bean Bag Filling in Australia?